UPDATE #5: As of Mar. 16, 2019, we have begun sending out secret Saturday communications to our Confidential agents who helped us out in this campaign to fund traditional offset printing for C-U Confidential issue 10! You will find them under the Updates tab here; you can also have them sent directly to your In Box by donating a bit to help us top off our earnings and fulfill the stretch goal. We will slowly but surely reveal bits and pieces about how the issue is shaping up as well as share excerpts EXCLUSIVELY RIGHT HERE. Make sure you're among the first to know what we know before CUC #10 emerges on the streets of Champaign, Urbana, and those Illinois cities beyond! Thanks!!! Greetings! My name is Jason Pankoke. I live in the Midwest college town of Champaign, Illinois, and have called it home for a quarter century. I have worn many hats as a friend, laborer, artist, creative, volunteer, and media tinkerer since I moved here in 1993. My most distinctive feat, however, has been taking on the role of self-publisher and all the highs and not-so-highs that go with that responsibility. I have published C-U Confidential as a Weblog since 2006 and print digest since 2007. It is a grassroots chronicle of what cinema-going, film-making, and appreciating the art form might mean to the residents and transient academic population of a smaller town like Champaign and its immediate neighbor, Urbana. It is a constant source of stories and information for our community. The ‘blog has been and always will remain accessible to everyone for free. CUZine, obviously, takes funding to produce, even if we distribute it for free. Over the course of producing the last three issues including the one we have in progress, #10, our traditional advertising revenue has mostly dried up. We relied almost exclusively on these funds to print the issues and break even so we could place them in dozens of public spaces for the taking and/or hand them out at will. It took several tries through e-mail and social media blasts to scrape by with enough to produce both #8 and #9. We have made two (2) attempts so far to book ad space in #10; what we have today is not nearly enough so, now, we turn to you, the Champaign-Urbana community and supporters of independent and regional cinema. The goal is to raise at least half of our projected $2,200 print budget for C-U Confidential #10 through this campaign. We hope the rest can come from our typical sources but we can’t bet on it just yet. We will expand our goal to cover any shortfall by ad revenue if we can first hit our $1,100 minimum. Extra pledges that put our available budget north of $2,200 total will go towards a larger press run so we may have better coverage to distribute the digest in locations outside of Champaign-Urbana and at public events. What exactly will one read about in #10? David Gracon, a professor at Eastern Illinois University, talks about Hallways Microcinema wherein he presented alternative media programs in his home. James Hall, a University of Illinois junior in cinema studies, reports on the former UI undergraduate film journal MacGuffin. Troy Michael, the publisher of Innocent Words Magazine, theorizes on what keeps him going in the lively world of independent journalism and fandom. I will present a “lost” (yet relatively recent) interview with Skip Huston, discussing the success of the Avon Theater in downtown Decatur, IL, in addition to the detailed and wide-ranging miscellanea that fills out every issue. All this material will be exclusive to this publication when it streets; we hope to see our dearest readers browsing through and sharing #10 with others beginning in late January 2019. Therefore, our self-imposed deadline to reach the minimum $1,100 goal is [Sunday, December 30, 2018] January 25, 2019. 3. Anyone who pledges $60.00 or more will receive either A. ten (10) copies of #10, or B. a complete, unread set of CUZine #1-10. 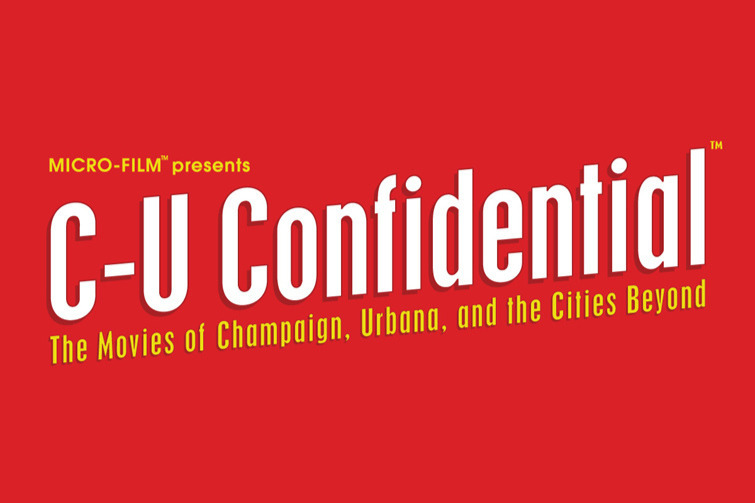 We hope that our track record with producing C-U Confidential in all its forms (digest , ‘blog , Facebook ) and its slightly younger cousin, the New Art Film Festival of Champaign , speaks for itself in its uniqueness and dedication to supporting and recording a part of the culture that makes our Twin Cities an interesting and vital place to be. Let’s collectively afford CUZine the respect it deserves by giving #10, the formal close of its first decade, the boost that it needs to go to press and then land in the hands of our friends and neighbors one more time. Thank you for your consideration. SECRET SATURDAY MESSAGE #5 [WEDNESDAY EDITION]: Don't be cross with us, Confidential agents, for being late with our report! We took our brief trip to Champaign-Urbana, set out free digests at the Small Press Fest on Saturday, visited with Geoff and the remaining video vault at Parasol in Urbana, and ran into good friends along the way. A much-needed refresher now gives way to the much-anticipated final stretch! At this time next week, we'll be done with the manuscript (!) and beginning the layout production (!!) as well as farming out proofreading to a couple of trusted agents (!!!) to help us get this issue in the can. (Our peeks at the content will now begin with our next message.) We are also (???) making early plans for each of our next two issues, which we hope will contain some involvement from our communities! SECRET SATURDAY MESSAGE #4: Are you enjoying this lovely day, Confidential agents? So are we! But, shhhhh, don't tell anyone else. The word on the street *should* be that we're hard at work on C-U Confidential issue 10 (hint: we are!) and we're not letting up until we have our cartons of copies in hand to hand out to our friends, neighbors, and YOU! We have three-quarters of our editorial finalized, much of our visual material gathered together, and almost all of our ad materials are ready to go. We hope to begin layout in less than two weeks! And, starting next week, we'll finally begin giving you sneak peeks at what you'll be reading in our pages! SECRET SATURDAY MESSAGE #3: Good day, Confidential agents! We'll keep today's update brief, with one cool announcement (among, hopefully, many!) to share as we wind down this journey of bringing C-U Confidential issue 10 out of our heads and to our community! We can safely say that all the guest editorial *and* the boilerplate segments are ready to go, while your humble editor clamps down on his own writing in the hopes it will be in shape in the next week or so. Remnants of advertising commitments are coming in now. We also just confirmed that we will have a place at the first Small Press Fest to be held 10 a.m. to 2 p.m. on Saturday, April 13, 2019, at the Independent Media Center in downtown Urbana, Illinois! We'll at least display past issues of CUZine for attendees to pick up, and we'll know close to show time if we'll have a representative on hand. Please consider checking it out if you live nearby. SECRET SATURDAY MESSAGE #2: Afternoon, Confidential agents! We are in the middle of finalizing all the material that will appear in issue #10, the issue that YOU will help us to put on the board, and we can't wait for you to learn about what is happening with the cinema in Champaign, Urbana, and the cities beyond! We'll be coming to town soon to shoot the newest cover and to gather some intel for the 'blog and our follow-up issue, which we will announce soon as we may need YOUR input on it - not from the money side, but what would appear in its pages. A valued agent has asked if we would be at Roger Ebert's Film Festival, a.k.a. "Ebertfest," between April 10-13 even if the new issue isn't ready. The official and semi-secret answer is, "We may be in the area at that time to attend and possibly display at a different event." If/when that is finalized, we'll let you know where we'll be so you can come visit us if you are in C-U that weekend.